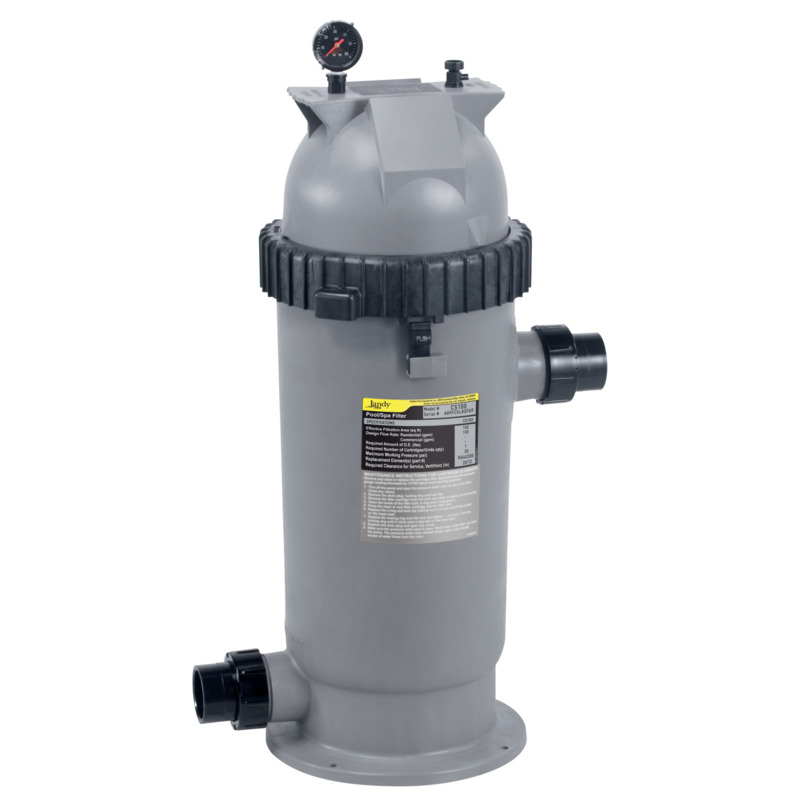 In a much more compact body, the Jandy® Pro Series CS Filter line utilizes single element cartridges designed to provide the same great water filtration as the Zodiac Large Tank Filter series. The cartridge element on the CS is easily removed, making it simple to clean and care for. The CS Filter is the perfect choice for small equipment areas at just over a foot wide. It is designed for Zodiac’s Versa Plumb® system and easily connects with the rest of your Zodiac equipment, using minimal space on the equipment pad. The CS Filter features easy grip ergonomic handles and extra-large drain ports in a compact, thermoplastic body. 32 3/8" 32 3/8" 42 1/2" 42 1/2"
1. Hole in filter cartridge, replace filter cartridge if necessary. 2. Worn o-ring seal inside filter. Replace o-ring. High pressure on start up. 2. Partially closed valve on return line. 3. Pump may be oversized. Check selection. 4. Filter dirty. Clean filter per instructions. 1. Check pump basket for debris. 2. Check for air leaks on suction side. 3. Check for restrictions or blockage in either suction or return lines. 4. Filter needs to be cleaned or replaced. 5. Pool water level too low. 7. Pump impeller vanes blocked. 8. Strainer baskets not being used and/or not being cleaned regularly. 9.Pump operating under speed (low voltage) or at low speed. 1. Presence of algae. Check sanitizer levels. 2. Check pH and total alkalinity. 3. Pump output exceeds design flow rate of filter. Check pump performance. 4. Ineffective cleaning, check conditions, replace filter cartridge. 3. Heavy bathing and or dirt loads. 7. Hole in filter element.